Dr. Anthony (Tony) Murphy has been appointed director of The Global Learning and Observations to Benefit the Environment (GLOBE) Program. BOULDER, CO--(Marketwire - Sep 24, 2012) - The University Corporation for Atmospheric Research (UCAR), an internationally recognized consortium of more than 100 member and affiliate universities that teach and study atmospheric and related science, announced today the appointment of Dr. Anthony (Tony) Murphy as director of The Global Learning and Observations to Benefit the Environment (GLOBE) Program. 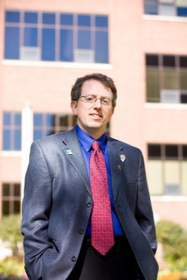 Murphy is internationally known for his work in STEM education. Most recently, Murphy served as Executive Director of the National Center for STEM Elementary Education at St. Catherine University in St. Paul, Minnesota. GLOBE, an international science and education program that connects a global network of teachers, students and scientists to better understand Earth as a system, is headquartered at UCAR in Boulder, Colorado. "Tony Murphy represents a significant move forward," said UCAR President Dr. Tom Bogdan. "He brings a powerful blend of experience and leadership in the fields of science, technology and environmental education to GLOBE. His leadership will further ensure the continued success of The Program and we look forward to strengthening the ties between scientists and GLOBE students and teachers around the world. Together, we will remain focused on cultivating the next generation of scientists through hands-on investigation of Earth." Murphy has been associated with GLOBE since its inception in 1995, as a National Oceanic and Atmospheric Administration (NOAA) Knauss Policy Fellow. "For more than 15 years, I've had the fortunate opportunity to witness the tremendous growth of The GLOBE Program and its impact on both the education and science communities," Murphy said. "I am honored to advance the important work of GLOBE and collaborate with its impressive network of international partners. Together we can expand the reach of The Program and unite even more teachers, students and scientists from around the world with common studies of Earth system science." While at St. Catherine University, Murphy developed a model for pre-service teacher training which structures science teaching on age-appropriate investigations (using GLOBE protocols) of atmosphere, hydrology and soils. In addition, Murphy played an integral role in developing the National Center for STEM Elementary Education (at St. Catherine) into the only elementary education department in the United States that requires STEM certification of all graduates. This effort resulted in a cadre of primary school teachers entering the workforce with solid scientific training and a confident approach to teaching science. "GLOBE is an international collaborative -- a worldwide community that promotes global awareness, scientific literacy and attention to real-work issues," Murphy said. "We will continue to raise the next generation of scientists through our robust offerings including: the Student Climate Research Campaign (SCRC), extensive hands-on teacher training; a robust and interactive website and social tools; and support of our international partners to ensure that GLOBE remains at the forefront of global science education." Dr. Murphy was selected following a rigorous search. Acting GLOBE director, Hanne Mauriello, filled the position shortly after the passing of Dr. Andy Tasker earlier this year. Dr. Tasker had been deeply involved in GLOBE since 1996, first serving as national head of GLOBE in the United Kingdom and later becoming its Director. He was a passionate champion of The Program, education and the environment. "As a longtime GLOBE Partner, Tony is keenly aware of the value of GLOBE," Mauriello said. "I have great confidence that he will provide GLOBE with distinguished leadership. I am delighted to have him join us." Funded primarily by NASA with support from NOAA and NSF, GLOBE is an international science and education program that connects a network of students, teachers and scientists from around the world to better understand, sustain and improve Earth's environment at local, regional and global scales. By engaging students in hands-on learning of Earth system science, GLOBE is an innovative way for teachers to get students of all ages excited about scientific discovery locally and globally. To date, more than 23 million measurements have been contributed to the GLOBE database, creating meaningful, standardized, global research-quality data sets that can be used in support of student and professional scientific research. Since beginning operations in 1995, more than 1.5 million students and 59,000 trained teachers from more than 25,000 GLOBE schools in 112 countries have participated in GLOBE. For more information or to become involved, visit www.globe.gov. The University Corporation for Atmospheric Research (UCAR) manages the National Center for Atmospheric Research (NCAR) and the UCAR Community Programs (UCP) on behalf of the National Science Foundation (NSF) and the University Community. It should be noted that any opinions, findings and conclusions, or recommendations expressed in this publication are those of the author(s) and do not necessarily reflect the views of NSF.